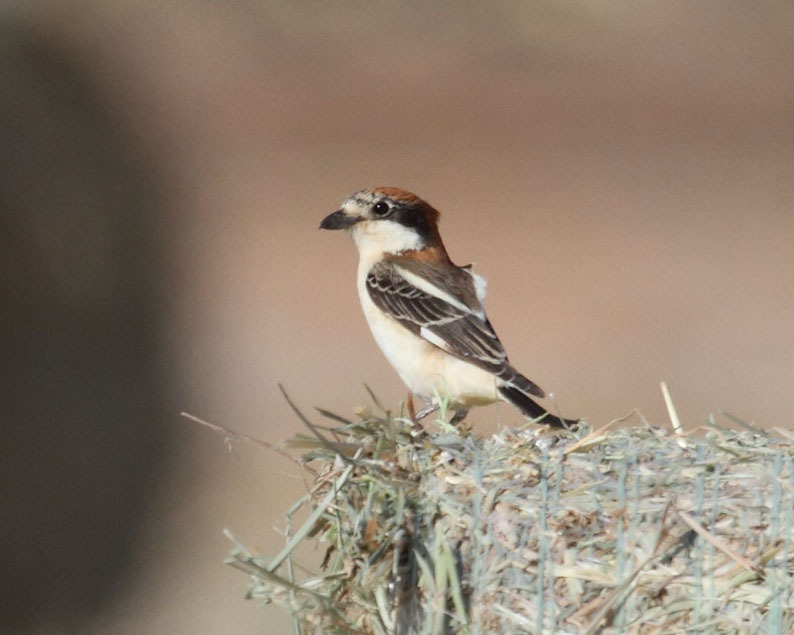 BIRDMAD: Israel trip with Birdfinders - Final days 6 and 7. Sunday & Monday. 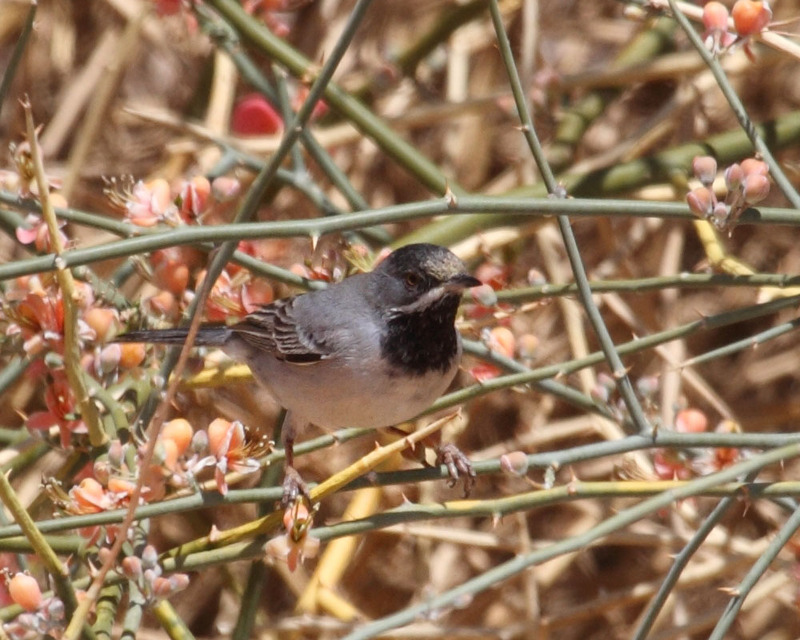 Israel trip with Birdfinders - Final days 6 and 7. Sunday & Monday. This was our last full day. A brief trip to Shulamit Park produced the usual mixture of migrants. 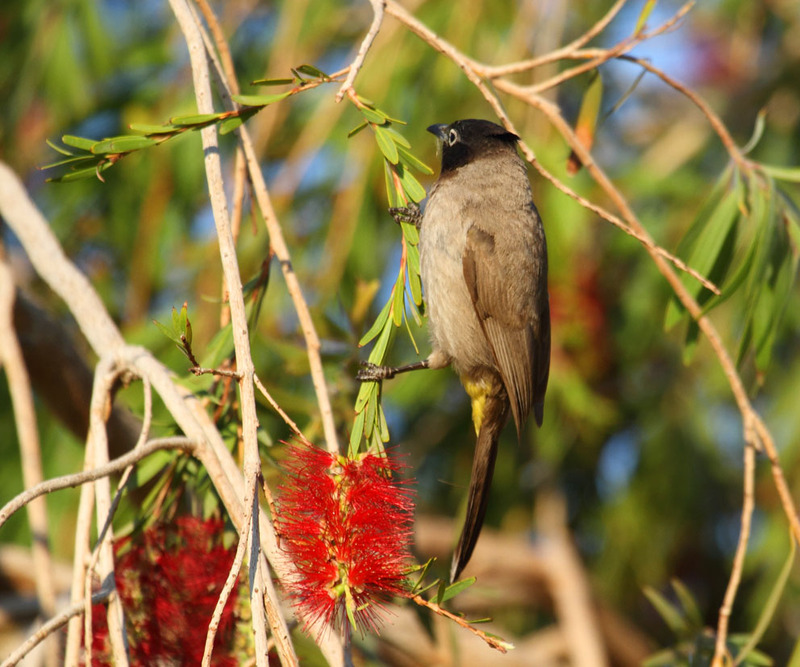 This is a yellow vented (or spectacled) bulbul, a common bird in Israel but a lovely one. After an ample breakfast, we headed up to the mountains where there was a good chance of a large raptor passage. Our guides' hunch was correct. In about 75 minutes we enjoyed a constant passage of several hundred raptors. There were many steppe buzzards but also a number of black kites, steppe eagles, booted eagles, a long legged buzzard and an osprey. Our next stop was Holland Park again. Whilst we were let loose all over the park, our 2 guides headed up to the far end. With hindsight, I can only imagine they had prior information which they wanted to check before calling the group. At some point Martyn had to come and find everybody, giving them instructions to make for a particular bush at the very far end of the park. This seemed rather inefficient and an example of poor communication. Anyway, the bush in question was alive with small warblers. It gave me my first views of Ruppell's warblers, subalpine warblers and, very briefly, Menetries warbler. After Holland Park we headed again to Yot Vata for lunch. Then we split into 2 groups. I was loosely with a group looking for Caspian plover whilst the others looked for greater hoopoe larks. 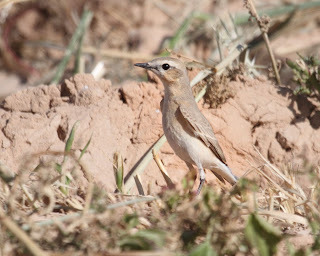 The Caspian plover hadn't been seen for a few days and I thought the chances were very slim. 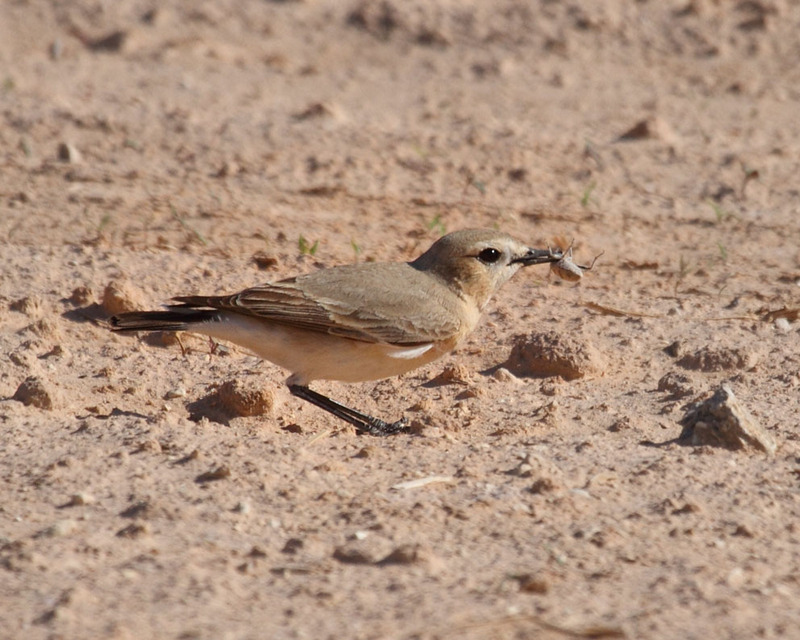 I stayed in the same place mainly photographing a northern wheatear beating the living daylights out of a beetle! 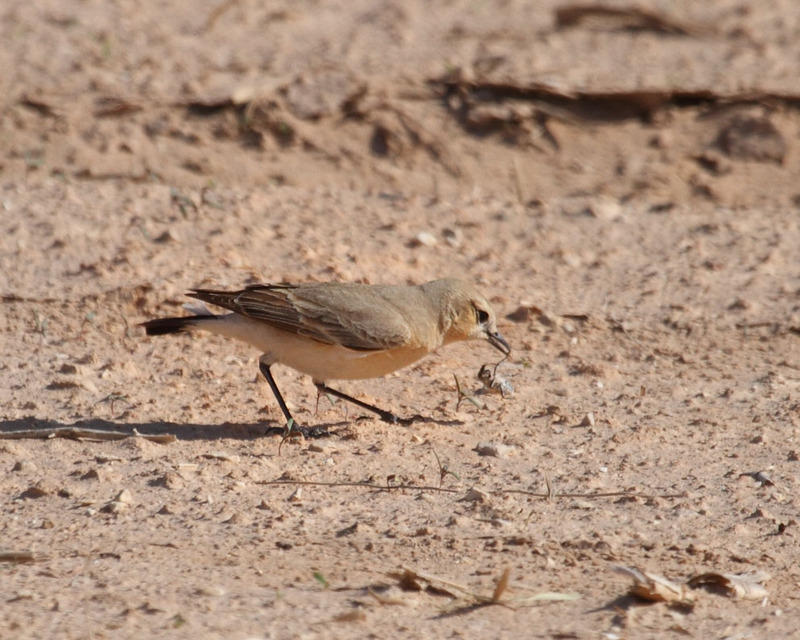 Northern wheatear - here he is about to start on the beetle! 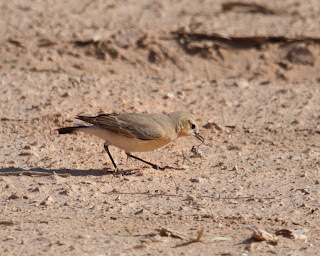 Northern wheatear - "I'll have these legs off!" Northern wheatear - the fight continues! I also came across a woodchat shrike. 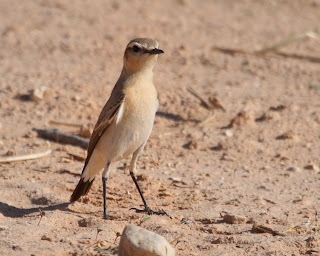 . . .
. . . an isabelline wheatear. 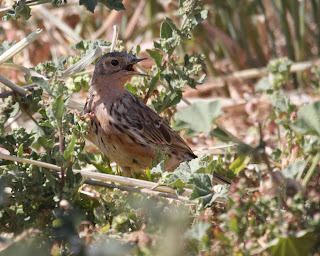 . .
. . and a red-throated pipit. Subsequent, we split up again. Some of the group went looking for the reported Oriental turtle dove whilst others, including me, went to the salt pools looking for greater sand plovers. We did eventually see one very distantly, but the Oriental turtle dove was not to be seen. 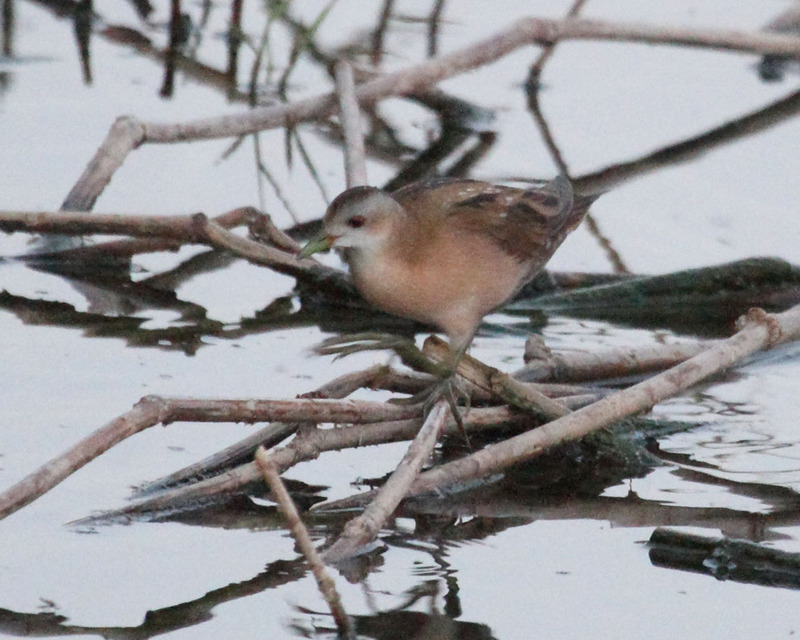 At the end of the day we watched a pair of very unselfconscious little crakes which came right out into the open about 10 or 15 m from us. ﻿ This happened while we were waiting for dusk and the arrival of some Lichtenstein's sand grouse . They did eventually arrive but they landed on the far side of the pool instead of near us. We could just make out their silhouettes on the other side of the pool. This was the day of the 350 km drive back to Tel Aviv. 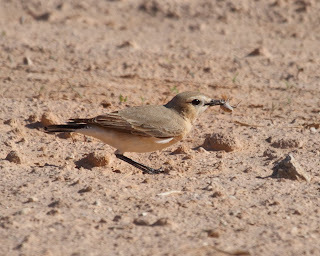 However, we did make an early visit to a site close to Eilat in search of a hooded wheatear. It was not to be found but we did see a white tailed wheatear, a common cuckoo, some blackstarts, an eastern Bonelli's warbler and a very pale short-toed eagle. Some of our number were keen to see long billed pipit. As we got closer to Tel Aviv we stopped at a nature reserve in the southern Judaean hills. The guides left all of us at the top of the valley whilst they drove most of the way down again, leaving unclear instructions. 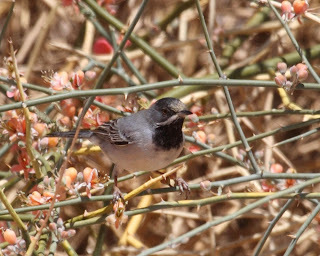 As a result I didn't see spectacled warbler and only saw long billed pipit in flight rather than being able to see it perched. This was another example of poor communication. 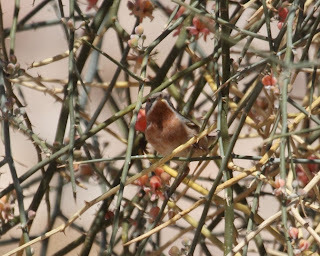 Nevertheless, I was very happy overall with the birds I had seen on the trip. James and Martyn used their experience and truly astounding call recognition ability to find many birds that I would never have seen. I would certainly recommend Birdfinders. After the usual strict security at the airport, our flight was on time and arrived at Luton a few minutes early. It was quite chilly while we waited for the minibus to take us to the off-site car park. We finally got to bed at about 2 in the morning, exhausted but exhilarated by the trip.